European Capital of Culture in 2008, Sibiu is a marvellous blend of multiculturality, traditional and contemporary art forms, idyllic squares and architectural wonders. The city is surrounded by picturesque landscapes and villages where the life rhythm is animated by traditions, celebrations and a bucolic way of living. Transform your visit into an immersive experience and discover Sibiu’s magnetism. The Medieval Citadel of Sibiu or Cibinium was founded in the 12th-century by the Saxon colonists that settled in southern Transylvania. Having the role to protect the borders of the Hungarian Kingdom, the Saxons erected thick walls and strong towers to prevent the invaders from entering their city. Today, some of the walls are still standing as witness to immemorial times, while strikingly beautiful Renaissance and Baroque buildings have replaced the medieval houses. Start your tour on the Citadel’s Street, near the Citadel’s Park and follow the ramparts. Sibiu is also known as the ‘City with Eyes’, where hidden pairs of eyes watch over the locals. Wherever you go, you will feel like you’re being observed and spied from the houses’ roofs. In fact, each house has little windows on the housetop, skylights that are eye-shaped, built in the first place for the attic’s ventilation. Today, they are veritable symbols of the city. Go inside a museum or monument and maybe you can get away from their sight. Each Friday, between 8 a.m. and 2 p.m., local producers come from the area surrounding Sibiu to sell homemade products. You will find them in the Huet Square, in the Evangelical’s Church courtyard. At the market, you can find a wide range of bakery products, cheese, sausages, fruits, vegetables, all coming from the producer’s gardens and farms. 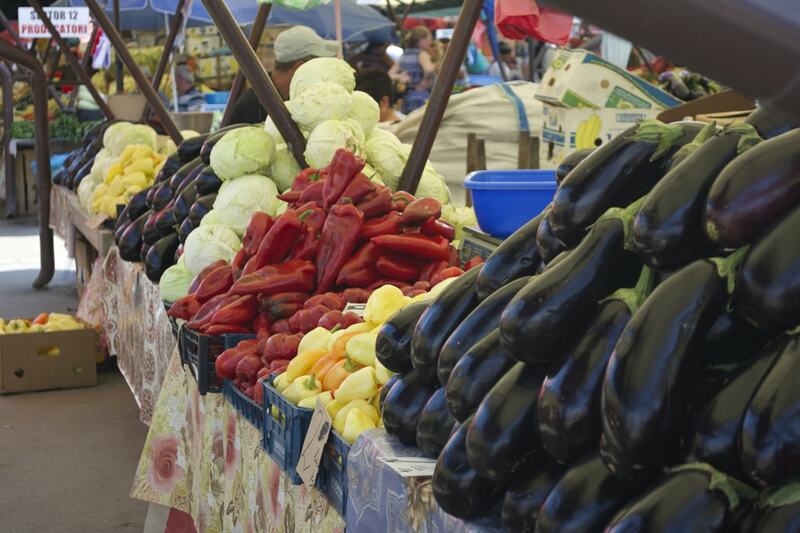 Taste the delicious fruits, the healthy vegetables and don’t leave without buying warm bread. Besides being a monumental gothic structure, the Evangelical Church is an impressive monument not only for its architecture but also its wonderful acoustic and stunning organ. From May to September, organ concerts mesmerize locals and visitors with heavenly sounds and a whimsical atmosphere. In order to find out when the next organ concert is, take a look at the calendar. Don’t miss this magical experience. Every year, on July 24, Sibiu celebrates the anniversary of one of its most important personalities: the nobleman Samuel von Brukenthal, a former governor of Transylvania. On this occasion, the actual museum housed in the Baron’s baroque palace gives free access to its galleries for all visitors. The Brukenthal National Museum features a European Art Gallery showcasing different art forms developed over the centuries and a restitution of the time’s interiors, recreating the 18th- and 19th-century atmosphere. All year long, Sibiu’s squares are spirited by its captivating events. From classical music to medieval re-enactment to performing arts to fashion shows, there is always something happening. Film festivals like ASTRA Film Festival, dedicated to European documentary films, Medieval festivals like ‘Transylvanian Citadels Festival’ or performing arts festivals like Sibiu International Theatre Festival are getting the locals out of their homes and inviting travellers to discover the city’s effervescent art scene. You won’t find it in the very heart of the historical centre, but surely you can’t miss it. With a dome and two towers that can be seen from any panoramic point of the city, the cathedral impresses with its splendour and is one of the symbols of the city. Built in an oriental style and decorated with remarkable frescoes, the edifice is awe-inspiring. A tour of the church is like passing from one Biblical scene to another, discovering the Orthodox faith. A passage that links the Small Square with the Huet Square, the Lies Bridge is a place of legends. Some say that lovers used to swear their love on the bridge and the girls vowed that they were virgins. If, during the wedding night the man discovered that it was a lie, the women were thrown off the bridge. Another legend says that the bridge was often crossed by merchants who used to mislead the locals. When such a merchant was caught, he was thrown off the bridge too. Nowadays, people say that if you tell a lie while crossing the bridge, it will shudder until the liar is telling the truth. Will you take the risk? What used to be a Medieval Gate and tower between the Big Square and the Little Square is today one of the best panoramic spots of the city. Climb the 141 stairs and relish one of the most beautiful views of Sibiu. If the ascent may take some effort, the panorama is totally worthy. Located in the Dumbrava Sibiului, at just five kilometres (three miles) from Sibiu, the ASTRA Museum of Folk Civilisation is spread over 96 hectares, showcasing traditional houses and workshops brought from all over Romania. During the summer, traditional events are organised, promoting the local crafts. You can spend a half-day or even the whole day inside, wandering on the museum’s alleys and discovering the fascinating architecture. You can also enjoy a boat trip on the museum’s lake or take a ride in a carriage to have a full traditional experience. Sibiu is located close to dazzling Transfagarasan road, a route crossing Romania’s highest mountains, Fagaras Mountains. A ride on Transfagarasan is both exciting and impressive as the road goes higher and higher in the mountains and the curves are tighter and tighter. You can take your own car or the Balea Bus; go as far as Balea Waterfall and from there take the cable car to Balea Lake. The views are breathtaking. Before Christmas, Sibiu takes its holidays clothes and the Christmas Fair is installed in the Big Square. The fairytale, handmade decorations and warm gloves and scarves lure locals and visitors. Try the delicious homemade mulled wine while enjoying the celebratory atmosphere.